Give the turkey a rest this Christmas and cook this Festive Beef Wellington instead. It can easily be prepared in advance and is a real crowd pleaser. Read on to find the recipe. The moment you decide to serve up a festive beef wellington for your guests the questions start coming. Can a beef wellington be prepared in advance? 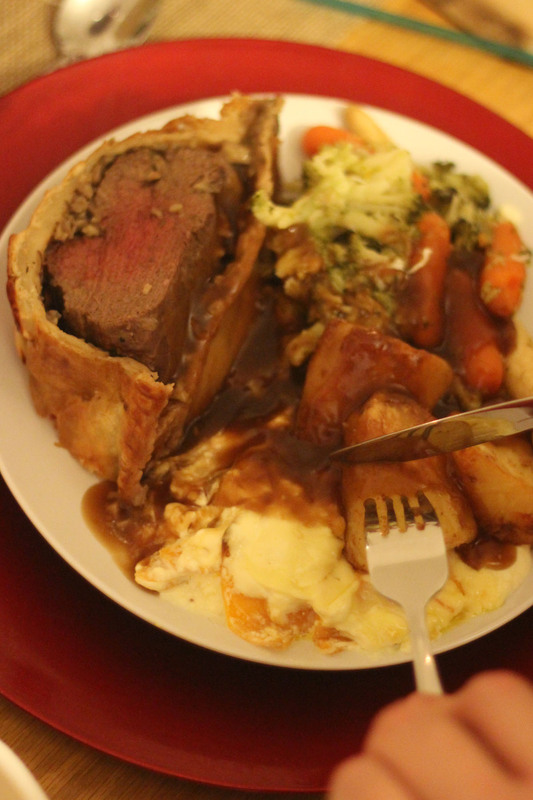 Can I cook a beef wellington the day before and re-heat it? How do I know if my beef wellington is done? How long should I cook the beef wellington to get it rare, medium or well done? Where can I buy a whole beef fillet? How much beef should I have per person? The list feels endless. As I trawled through reams of advice in cook books, on the internet (thanks Felicty Cloake and Good Food) and from well meaning friends and family I seemed to find more questions than I was answering. The first hurdle I faced was actually BUYING the meat. Considering we don’t actually eat meat in my house I didn’t feel quite so stupid not realising that our supermarket doesn’t actually have a butcher’s counter. When I do buy meat I tend to get it from the butcher’s near work but as I’d got time off this week to prepare my meal heading into central London just for a bit of meat wasn’t going to happen! After a lot of to-ing and fro-ing. I ended up ordering from Westin Gourmet. It was far from cheap and delivery had to be made to my Dad (35 miles away) so that we could guarantee a £70 lump of meat wasn’t going to get nicked from outside our flat if it was delivered while I was out. Once I’d got the meat from my Dad on Friday I could think about cooking it. Fortunately once I actually had my meat things went a little smoother. The pastry was pre-bought (sorry, couldn’t bear the thought of making my own!) but the mushrooms were home grown (thanks Pret a Pousser!) And, by some miracle, I managed to get it prepped the night before our big dinner. Phew. Having spent so much on this prime cut, I really wanted to make sure I did it justice. If this piece of beef ended up overdone, dry and tough, I was not going to be happy! The day of our meal I calculated and re-calculated my cooking times over and over again. In the end we opted for a brief 25 mins in the oven with 10 minutes resting so that it would come out medium-rare. To my delight it was pretty much spot on. Follow the recipe below and hopefully you’ll have the same success! I did perhaps neglect the other side dishes somewhat as I was so paranoid about the festive beef wellington being a disaster. But my Butternut Squash Dauphinoise were a hit as ever (recipe hopefully coming soon!) Until then read on to find out how to make this delicious, classic dish. Pre-heat your oven to 200C or gas mark 7. Place the beef fillet on a roasting tray and brush with a little olive oil and season with salt and pepper. Road the piece of beer for 15 minutes for medium-rare, or 20 minutes if you prefer medium. Once cooked, remove the beef from the oven and allow to cool completely before placing in the fridge for at least 15 minutes. In the meantime, finely dice the mushrooms. Heat a little olive oil and the nob of butter in a frying pan and fry the mushrooms for 10 minutes or until they begin to soften. Add the garlic, wine and thyme and cook for a further 10 minutes until the liquid has soaked up and the mushrooms have begun to stick to each other creating a a coarse paste. Place the mushrooms to one side, and again allow these to cool before progressing to the next stage. Once the beef and mushrooms are both cool, take the puff pastry and cut off a piece roughly 1/3 of the total pastry. Roll the smaller (1/3) piece of pastry into a rectangle roughly one inch longer and wider than the beef fillet and place on a piece of grease proof paper. Place a little of the mushroom mix down the centre of the pastry and place the beef fillet on top. Spread the mushroom pate over the beef fillet before spooning over the chopped mushroom mix, ensuring that it sticks to the fillet. Roll out the second, larger piece of pastry until it is big enough to entirely encase the fillet. To seal the top piece of pastry to the bottom piece gently press the edges with a fork. Trim the pastry so that it forms a neat rectangle. Beat the two egg yolks and brush the beef wellington all over. Leaving a little of the egg yolk behind. Take any scraps of pastry and use these to decorate the wellington as I did with leaf shapes. Use any remaining egg yolk to brush the decorations. 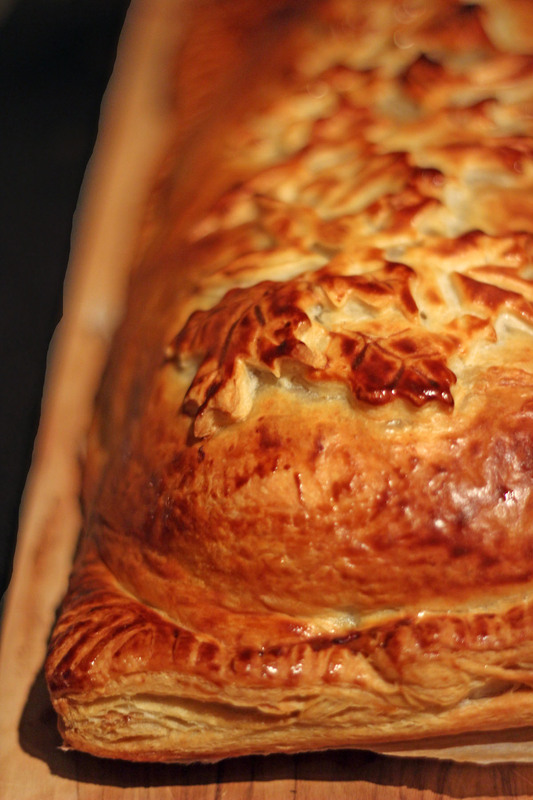 Chill the wellington in the fridge for at least 30 minutes or for up to 48 hours. When ready to cook, pre-heat the oven to gas mark 6 or 180C. Make sure the baking sheet you intend to cook the wellington on is also in the oven at this stage. Once the baking tray is nice and hot ,slide the wellingtonon to the tray and cook for 25 minutes for medium-rare or 30 minutes for medium. Once the pastry is crisp and golden, remove from the oven and allow to rest for roughly 10 minutes before serving. In hindsight I probably shouldn’t have been quite so worried about cooking this. Beef Wellington is a classic recipe that is tried and tested. Most of the recipe follow a similar vein – good piece of beef, surrounded with cooked mushrooms and encased in pastry. If you follow my classic recipe you won’t be disappointed and you’ll be able to relax while you cook. The first picture on this post made my mouth water – that pastry looks so inviting!! I love beef wellington, what a great way to celebrate! This looks amazing Emma! And you look wonderful too 🙂 I love beef willington, pinning to try later! oooh I love a good beef wellington with its lovely crisp coating of pastry. Might make this as one of our festive meals this year. yum! It looks like you cooked this to absolute perfection! Love the festive shapes on top too. Thanks Kerry! I knew having fancy leaf cutters would come in handy at some point 😉 it was a rather impressive centre piece for the table! Aww thanks Camilla you’re too kind! Often when we associate things with work we avoid them at home 😉 this however is too delicious to miss out on!